an abundant source of knowledge etc. This dream began with the opening of Fountainhead Preschool in Surat in April' 05, which started with six students and today it has more than 315 students and is growing every year. The preschool has already made a mark on the city as a provider of high-quality innovative education. 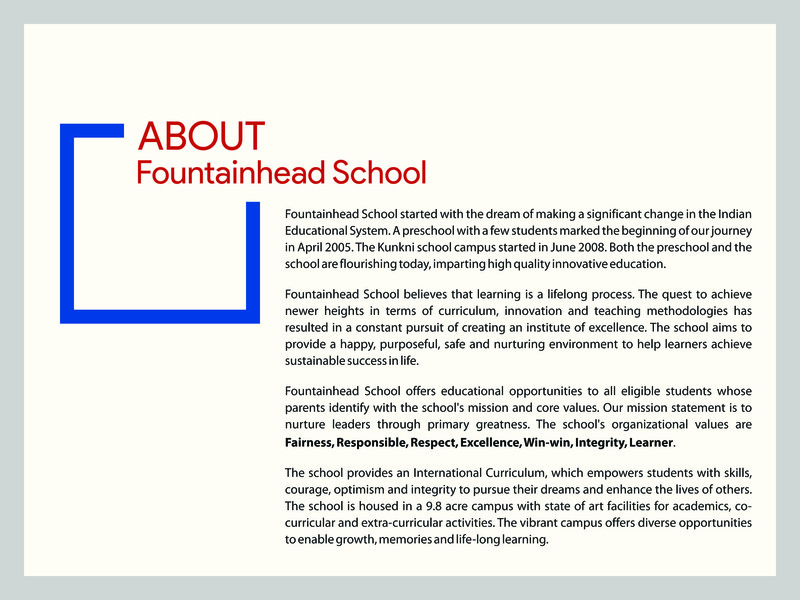 And now the dream is flourishing with the growth of Fountainhead School in Kunkni, Surat, which now has 1800+ students from Nursery to Grade 12. 1. The relationship between a teacher and a student, the school/teacher (who represents the spring, the principle source of knowledge) is the spring who imparts knowledge to the student (who is the stream, the beneficiary of the knowledge). The extended hand shows the school/teacher inviting students to learn. The open arms represent the general ambience of the school, where the teachers share a healthy and open relationship with their students, where students learn to be fearless in expressing their ideas/opinions, where the teachers work towards nurturing the child and helping the child attain and reach his/her true potential. 2. The magic is in the bond shared by the one who imparts knowledge and the one who imbibes it. That bond is the principle source of something great which can only be achieved when it is a collaborative effort. To achieve greater heights, the bond has to be strong. The logo symbolizes the bond and the sharing of knowledge.